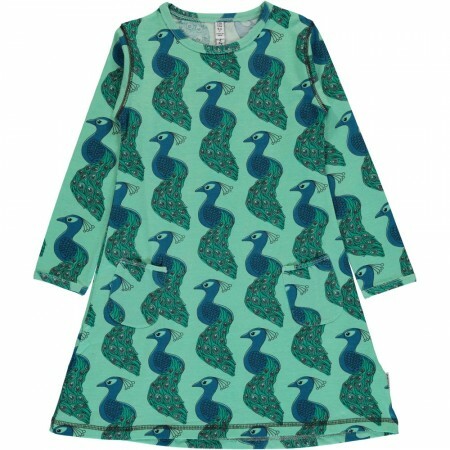 This organic long sleeved dress features the Maxomorra Explore Peacock print on a pale green background. Your kids are going to love this comfortable, colourful and stylish dress which is made from soft cotton jersey. The dress is made from organic soft cotton with trims, overlock hem and includes two front pockets. The cotton weight makes this dress comfortable and still warm. Maxomorra “Explore” range at Babipur offering something a bit more grown up for Maxomorra fans. Hand drawn retro inspired prints that are super cool but still nice and comfy and true to Maxomorra’s organic and ethical values. Cool and trendy clothes for kids that don’t restrict movement so they dance and skate and play. 10 years of Maxomorra! Founded in 2008 Maxomorra’s signature Scandi repeat prints have taken the ethical fashion world by storm. Loved for their bright and eye catching designs and high ethical credentials. Maxomorra use GOTS certified organic cotton ensuring organic standards and fair trade throughout the supply chain. There’s something for everyone from this super Swedish clothing brand for babies and kids up to 8 years. Choose your favourite prints, mix and match with block colours or pick a contrasting print. Here at Babipur we just love Maxomorra!